Is the wheelchair for indoor or outdoor use? Do you need it to fold? Are there any seating requirements? Are there any speed requirements? Cost, how affordable is it? It also may be a good idea to speak with other individuals that have purchased or have used a power wheelchair in the past. They’ll be able to give you some of the best advice and recommendations. Ultimately, the user should give the wheelchair a test drive before a purchase is made. This doesn’t mean a testing it in the showroom. This means actually taking it home and putting it to some functional, real world use. Also be sure to check out the electric wheelchair reviews section of our site for user ratings and reviews on current models. Powered by a battery – Less physical exertion. Easily go uphill – Manual chairs could have difficulty. Front-Wheel Drive wheelchairs offer exceptional indoor/outdoor maneuverability with a design that mounts 2 large wheels in front of the seating area. They are great all around wheelchairs that are suitable for outdoor use but will tend to fishtail at higher speeds. For this reason they are typically manufactured to travel slower than other power chair varieties. The overall turning radius is about 22″ to 28″, depending on the manufacturer. 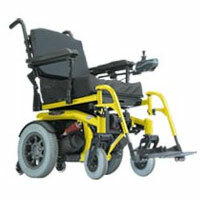 The design gives many users a sense that the wheelchair is pulling them due to the front mounted wheel position. Mid-Wheel Drive wheelchairs offer excellent indoor maneuverability because the wheels are located directly under the user. They typically are manufactured with 2 sets of casters located in the front and back that offer stability. Putting the wheels under the user’s center of gravity allows for an extremely tight turning radius. This design is perfect for small apartments, nursing homes, or anywhere else where precision movement is necessary. The one area of concern for a mid-wheel drive system is the ability to maneuver outdoors, over hills, and across tougher terrain. A mid-wheel drive system needs to remain on stable, flat surfaces for optimal performance. The fact that they are designed for indoor use doesn’t mean you can’t use them outside though and many retailers will advertise them as being both indoor/outdoor. Rear-Wheel Drive was the design for the original powered mobility device. They are stable, maneuverable, and offer the highest top end speeds available in a power wheelchair market (see speed chart below). Affixing the wheels in the rear provides the chair with excellent balance in almost any terrain. The major disadvantage with this design is that turning radius will typically increase compared with the front and mid configurations. 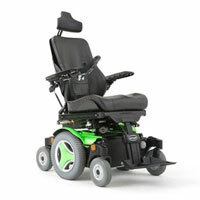 Rear wheel drive power chairs are great for outdoor use and provide predictable driving characteristics and stability. There are a variety of power wheelchair types on the market. In most cases they can be categorized by their configuration and use. The most popular modern power wheelchair offered by retailers is the platform style. This style incorporates a powered base with a completely separate seating system. Platform wheelchairs are often considered a more stable option compared to the traditional powered wheelchair. They are also easier to transport since the seat can be completely separated from the base. See Below. There are a number of other specialty power wheelchairs on the market as well including reclining and (rehab) tilt-in-space wheelchairs. Reclining wheelchairs have a seat backing that is completely independent of the chair allowing for separate functionality. The tilt in space wheelchair, on the other hand, not only reclines but completely shifts the weight of the user. The entire chair, including the seat, backing, leg & arm rests can be aligned to the users preference without assistance. One of the more recent alternatives to powered mobility is a hybrid or power assist system. This type of wheelchair incorporates a traditional manual wheelchair with the power of electric. The power-assist system is designed to increase the number of revolutions per pass thus giving the user a noticeable increase in propulsion efficiency. The power systems are light enough to be easily attached and remove to the frame of a manual wheelchair making transportation easier. There are a number of options when in comes to the wheels and tires of your power wheelchair. Most retailers typically offer 3 tire options: Pneumatic (air filled), foam filled, or solid rubber. Pneumatic tires offer an extremely smooth and stable ride. The air and tread on the tires hug the road. They really only have one drawback, they often require more maintenance, will often lose air, or if punctured, can go completely flat. The foam filled and solid rubber designs are also popular options. Even though you’ll feel every bump and indent in the road, you’ll have the peace of mind that they will never lose air or go flat. It usually comes down to user preference between one design or the other. The controller for most powered wheelchairs is a keypad alongside a joystick that controls both direction and speed. When the joystick is moved in any direction, the brakes disengage, and the chair moves. The further you move the joystick from the neutral position the faster it will go. When the chair is put back in neutral state, it will decelerate, the brakes will re-engage, and the chair stops. The keypad activates other functions of the chair that you may need. Some wheelchairs offer more sophisticated, alternative wheelchair controlling devices for individuals that have limited use of their hands. Some of the other controlling options are listed below. Foot Controls – pedals and buttons are added to the foot rests of the wheelchair. Chin Controls – the controller is mounted near the chin. Speech Controls – the controller uses a simple speech recognition program. Electric wheelchair users typically have limited strength in their arms and torso, and thus need an external power source for assistance. The battery used in most power wheelchairs is a (deep cycle) lead acid battery that is either a wet cell, a gel cell, or an AGM (absorbed glass matt) battery. Although they look and feel similar, electric wheelchair batteries shouldn’t be confused with car batteries. They are vastly different in design and use and should never be interchanged. Wet cell batteries typically hold a charge for longer and offer more power than the gel cell variety. There major drawback comes down to maintenance issues and leakage during transport. They are not recommended for travel because of the acids that are housed within the unit. If tilted or cracked the battery could spill and corrode the vital electrical systems, wiring, or motor of your wheelchair. Many air and cruse lines will often refuse to transport any motorized wheelchair if it is powered by a wet-cell battery. Wet cell batteries are relatively inexpensive compared to gel cell and thus are still very popular. Gel cell batteries were developed to alleviate some of the safety and maintenance concerns that were involved in transporting an electric wheelchair. Gel cell batteries are sealed and dry with no potential for spills. This is due to the silica gel that suspends the acids (electrolyte) in the battery. So if they are broken or punctured they will not leak. Gel-cell lead-acid batteries were developed to be maintenance free and should be approved for storage on most airlines and cruise ships. The disadvantage of gel-cell batteries is that they usually have less capacity and are more expensive. Power wheelchairs typically utilize 2 – 12 volt deep cycle batteries that must be re-charged on a regular basis. The batteries make them significantly heavier than most manually powered chairs, making it necessary for the wheelchairs to be manufactured with a stronger sturdier frame to support the battery, motor, the user, and any additional adaptive equipment. The range of the battery will often depend on a number of factors including: the users weight, ground level, and temperature. Speed – How Fast Can They Go? The speed of your power chair will typically depend on the model. The top baseline speed of most electric wheelchairs and many other powered mobility vehicles is about 4-5 MPH. There are, however, several brands/models that can travel even faster and are built for speed. According to 21st Century Scientific, their BOUNDER power chair series can reach speeds up to 11.6 MPH and is the fastest electric wheelchair. Range – How Far Can They Go? The distance a power chair can travel, or range, will largely depend on the model and its intended use. 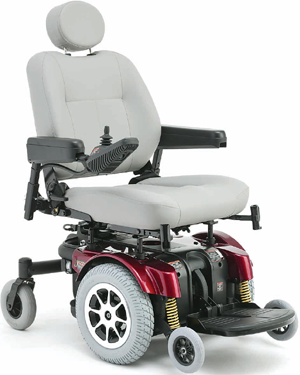 Many manufacturers will quote a range of 20 – 25 miles for a typical power chair. Ultimately, the range of your electric wheelchair will depend on a number of factors including: wheelchair battery type, battery age, battery size, the weight of the rider, maximum driven speed, drive train efficiency, driver behavior, and the terrain. In general, the use of a wet cell wheelchair battery will also increase the range. Range is an important metric that should be considered in the selection and design of a power wheelchair. With your doctor’s approval, Medicare should cover 80% of your wheelchair. Your supplemental or secondary insurance will cover the remainder. Medicare must be your primary insurance carrier in order to file the initial claim with them. If you have secondary insurance, often they will pay any remaining amount that Medicare did not cover. If Medicare is your secondary insurance carrier, you must first file a claim with your primary insurance carrier, wait until you are reimbursed by them, and then file with Medicare with any remaining balance. Most of the cost of your electric wheelchair should be covered under your medicare part B coverage. To qualify for this you must meet all of the criteria below. See the complete medicare list here. Your doctor must write the order for power wheelchair and inform Medicare of the need. Your powered mobility device must be medically necessary. You are limited in respect to your normal daily activities. You must be able to safely operate the wheelchair or have someone with you that can help. You must be able to use the equipment in your home and have accessible entrances and exits. Medicare Part B will pay up to 80% of the cost of your electric wheelchair from a Medicare-approved provider but you will have to meet your yearly deductible first. One cheaper, short term option to consider (if you don’t need a wheelchair for over longer than 6 months) is to rent an electric wheelchair. Renting durable medical equipment like this will ultimately lower your costs and if you wind up needing it for longer you can always buy it. Talk with your preferred electric wheelchair supplier to find out what options you may have. In January, 2011, Medicare began a “competitive bidding” program with the soul purpose of reducing costs. Now durable medical equipment suppliers must submit bids in order to qualify as a Medicare-approved provider. If you plan on using submitting a claim through Medicare, make sure to verify that the supplier you’ve selected is approved by Medicare. How to Choose: Take a look below for some valuable resources. Wheelchair Junkie Articles – Great articles – Excellent resource. 21st Century Scientific – 21st Century Scientific, Inc. manufactures Bounder power wheelchairs and accessories. Some models with speeds up to 12mph, some for users up to 1000 lbs. See The 21st Century Scientific Home Page. Teftec Mobility – Teftec specializes in designing, assembling and marketing motorized wheelchairs. Introduced the TransmissionSteering™ system. Drive Medical – Drive Medical was founded in 2000 and has quickly become a leader in the manufacturing of durable medical supplies (including power wheelchairs) and other mobility equipment. See the Drive Medical Home Page. Check out their complete selection of electric wheelchairs or browse their most popular electric scooters. Shop with confidence at SpinLife. 30-day money back guarantee. We offer a large selection of motorized wheelchairs at unbeatable prices. Choose from portable as well as folding power wheelchairs. Shop SpinLife for a complete selection of electric wheelchairs. Choose from Jazzys, Jets, Prontos and more. Prices start at just $1199 with free shipping. Medicare billing available. 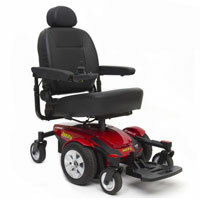 EasyMedOnline.com specializes in Power Wheelchairs, Electric Wheelchairs, and Power Chairs all across the United States. We have service and technicians across the country to provide in-home set-up and delivery, in addition to billing Medicare if you qualify. Receive up to 40% discounts and 110% price guarantee. Jazzy, Shoprider, and Golden electric wheelchairs starting at $1449. Call us for the best prices. Free delivery, in home set up and in home warranty service. All Styles Of Electric Wheelchairs. Discount Prices from $1199. 1-800-Wheelchair carries Pride, Invacare, Golden & more. Call or Order Online. Free Shipping. Wholesale prices on electric wheelchairs and other mobility devices like scooters. For over a decade, Vitality Medical has provided great customer service. Free shipping on orders over $100.